The United Nations inquiry into the 2005 assassination of former Lebanese Prime Minister Rafik Hariri has been granted a one-year extension. 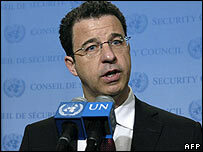 The move was approved by the UN Security Council as the probe's existing six-month mandate expired. The UN will also extend its technical support to the Lebanese authorities investigating 14 other attacks. 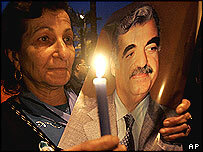 Mr Hariri, along with 22 other people, was killed in a massive car bomb in Beirut in February 2005. In a report presented to the security council on Wednesday, chief investigator Serge Brammertz said there were links between Mr Hariri's death and 14 other attacks in Lebanon since October 2004. "In light of the potential linkages between the Hariri investigation and 14 other cases, the commission believes that a much more concerted and robust effort is needed to move these cases forward," AFP news agency quotes him as telling the 15-member body. The cases included assassinations and attempted assassinations on anti-Syrian Lebanese figures, the agency reports. But Mr Brammertz stressed the links were from an analytical standpoint, and that more work was required to establish "evidentiary links", it adds. The chief investigator's report added that that Syria's co-operation with the inquiry had "further developed", and that "full and unconditional co-operation from Syria" remained crucial. Interim reports from the UN probe have implicated top Syrian officials in Mr Hariri's death, suggesting it was highly unlikely that the complex plot to kill him could have been hatched and carried out without Syria's knowledge. Mr Hariri's death triggered huge demonstrations in Lebanon against the Syrians. Damascus denied involvement but eventually bowed to international pressure, pulling out its troops after nearly 30 years of military presence. Lawyers at the UN are drafting a statute that, if approved by the UN and the Lebanese government, would lead to the formation of an international tribunal to try those accused of the murder.